Hey everyone! My name is Jennifer from the blog Tech with Jen. This is my first time to post to Simply Centers and I am super excited to get to know everyone! As you can probably tell from the name of my blog, I write a lot about technology. I have been using technology with my students for a long time. I have seen firsthand the power it can bring to the classroom. However, technology can never replace good teaching. For me, technology just adds that extra spark to an already fabulous lesson or center activity. Take the example I am going to show you today. Several weeks ago I flew to Texas to present at a conference. My session was on augmented reality. Haven't heard of AR? Well there are a lot of great resources and apps on the market. At its core, AR is when you scan a "trigger image" and some type of overlay appears on your device. It might be a picture, a video, or even some type of 3D image. I like to think of it as QR codes on steroids. When I arrived in Texas, I realized I forgot to bring my scissors and tape. I needed them to cut out my AR paper dice I had made for my session. I didn't want my paper dice to get damaged on the flight. 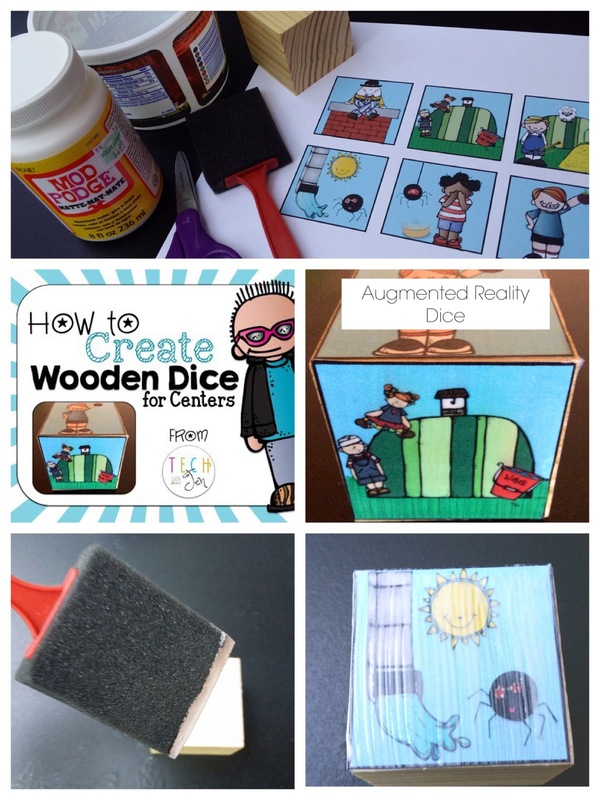 To make a long story short, I learned about a fabulous idea for creating my dice using a wooden block and Mod Podge. I was super excited about the idea and rushed out to purchase a package of blocks when I got home. If you use paper dice in your classroom, you might want to make these. I know my firsties were not always careful with the supplies I added to centers. I just ended up having to make new copies of my dice all the time! So you might be thinking, "What does this wooden block have to do with AR?" Well rather than tell you let me show you. So what do you think? Really cool, huh? If you are interested in learning how to make your own AR resources check out my Google site. If you would like the trigger images shown in the video you can click here. Hope this information helps you! I love to share ideas for using technology in the classroom. Come visit me sometime @Tech with Jen.